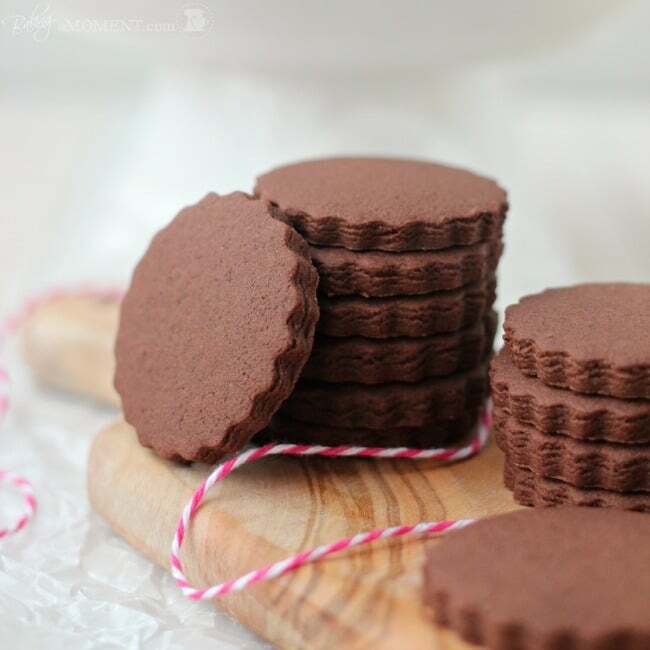 Simply the perfect chocolate sugar cookies! With a soft & tender center, crisp edges, and no spreading whatsoever as they bake. Mine was great! I worked my heiny off, you guys. I mean, wow. Like, 3 straight days on my feet. One recipe after another, nonstop. I was a machine! Everything was made from scratch, right down to the French-fried onions on the green bean casserole. It was awesome, and there was TONS of food. I had a great time in the kitchen with my mom and brother-in-law, and it was great to see everyone, especially my brand-new baby niece! We got home on Friday evening, just in time to have a day and a half with the other side of my family. So nice. And Sunday I was all over town looking for the Christmas tree, and then setting it up and decorating it. I’m so happy we are now officially in the Christmas season! Cookies are my favorite thing ever to bake, and I wish I posted more cookie recipes than I have been. I’m going to try to make that up to you guys over the next few weeks. Starting with these chocolate sugar cookies. What do you call this kind of cookie? Is it a sugar cookie? A butter cookie? A roll out cookie? A cut out cookie? A decorated cookie? I wasn’t quite sure what to call it but hopefully you get the idea. Last year at this time I got waaaaaaay into these. I’m sure you can imagine that it was a perfect outlet for my complete compulsion/neurosis/obsession with pretty food. They are so much fun, I loved coming up with unique designs and perfecting my decorating skills. You can waste all sorts of time playing with icing and toothpicks and sugars and sprinkles. But today I’m keeping it simple and sharing my favorite recipe for the cookie part. The flavor of the cookie is very chocolate-y. I am not one to shy away from bold chocolate flavor. If you’ve read my Simply Perfect Chocolate Cupcake post, or my Simply Perfect Brownie post, then you already know this about me. 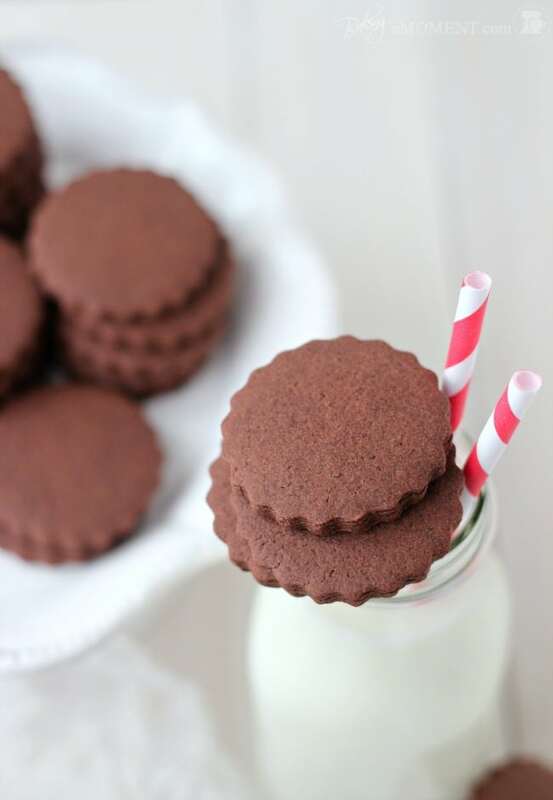 These chocolate sugar cookies have a deep, dark, chocolate flavor from all the cocoa (almost like an Oreo). It’s a little less sweet. I do enjoy eating this cookie plain, but I think it’s even more important not to overdo the sugar when you’re dealing with a cookie that’s going to be iced and/or sprinkled with sugar. (If you need an icing recipe for them, I’ve got one right here.) It’s all about balance, yo. Also, the texture of these chocolate sugar cookies is tender, yet sturdy. They come out of the oven with a little softness in the center, and a little more crunch around the edges. After a few days, they tend to lose the soft quality, so if you prefer a crunchy cookie, you will like that. They make a great gift, because of how sturdy they are. You can pack them up and ship them, and rest assured that they will arrive in one piece. The dough is great to work with. It holds together so nicely, so you don’t have crumbly crumbs all over your kitchen floor. You don’t need to sprinkle your work surface with flour (hallelujah!). Not only does this cut down on the cleanup, but it allows you to re-roll the scraps without them getting tough. And they bake up so beautifully, without spreading, AT ALL. This is the whole key, people. The edges are PERFECT. Cold butter: Chilling the dough helps prevent spreading. Using cold butter and working quickly eliminates the added step of chilling. Cutting it in small cubes helps it to incorporate more easily. Oil: Oil keeps the cookies moist/soft. If you prefer a crunchier cookie, you can replace the oil with an additional 1/4 cup of unsalted butter. Mix on low speed for the minimum time required to incorporate the ingredients. Make sure the mixture is smooth (no lumps of butter), but don’t cream until fluffy. Whipping in a lot of air will contribute to spreading. Leave out the leavening: there is no need for baking powder and/or baking soda. Leaveners make baked goods rise, puff, and spread. Omitting the leavening allows the edges to remain neat and clean, and the cookie lays flatter. The texture is still tender because of the ratio of fats to sugar and flour, but the cookie is sturdier. 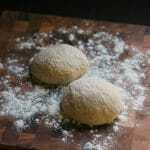 Cornstarch: Cornstarch lends tenderness and a softer texture, and helps the cookies to hold their shape during baking. Unsweetened Cocoa Powder: Gives a deep, chocolate-y flavor. Use the best quality you can get your hands on. I prefer natural cocoa powder to an alkalized/Dutch process, such as Hershey’s Special Dark. This brand will yield a darker color, but a less intense chocolate flavor. Flour quantity may vary. The longer the dough sits, the more it will dry out, so use more flour if you’re rolling/cutting right away; less if you plan to keep the dough in the fridge for a while before baking. I usually roll and cut right away, so I put in a cup and a half to start, then add more by the tablespoon until it starts to pull away from the sides of the bowl. Rolling the dough between two layers of parchment is cleaner and prevents toughness. Bench flour is not necessary with this method, and scraps can be re-rolled and utilized. Baking at a higher temperature “sets” the edges, allowing the cookie to hold it’s shape better. Baking times will vary based upon the size and thickness of your cookies. For this post, I rolled the dough to a thickness of 1/4-inch (using rolling pin rings) and cut 2-inch diameter cookies. They baked for 9 minutes. Larger or thicker cookies may require a longer bake time. The cookies are done when the tops take on a dry appearance, and the edges are firm. The centers may still be slightly soft. Yield will vary based upon the size of your cookies. For this post, I rolled the dough to a thickness of 1/4-inch (using rolling pin rings) and cut 2-inch diameter fluted circles, and the batch yielded 46 cookies. If you want to read more about how to make the most perfect roll out, cut out, butter/sugar cookies for decorating, check out this post I wrote last year. Also there’s a really great vanilla cookie recipe there. I hope you enjoy making these chocolate sugar cookies with your loved ones! I was intimidated by roll out/cut out/butter/sugar/decorated cookies, for the longest time, until I figured out this method for making it all much more manageable. Add the egg and mix just until incorporated. Mix in the cornstarch, cocoa powder and 1 1/4 cups of the flour. Cut shapes using a cookie cutter. Bake on parchment-lined baking sheets for 9 to 12 minutes, or until the cookies look dry on the surface, and feel firm around the edges and set in the middle. Who doesn’t like homemade bread! This is just perfect, too! Making naan was on my 2013 bucket list of to-do recipes. Not because I think it will be tricky, but I just keep putting it off. I don’t know why?! Yours looks delish! Pinned and ziplisted! The step by steps are super helpful, too! Thanks for taking the time! Absolutely Mariam! That should work just fine. Hope you enjoy, & thanks for reading! So glad you were happy with them Kim! Thanks for the great feedback! Simply gorgeous, simply superb my friend. I have to try it this holiday season. I love baking sugar cookies but always get stuck with dry bad batches. So glad you shared this with us. And your pictures are stunning as always. I officially love your Simply Perfect series, because everything is so… perfect! These are no exception. I typically hate roll out cookies (the work! the mess!) but I think I am going to give these a try if I have time. They look doable and sound utterly delicious – you had me at “deep, dark chocolate flavor”. Whew, what a tiring yet incredible Thanksgiving you had, Allie! It sounds wonderful. All I want to do during the holidays is spend time with friends and family, cook/bake and most importantly, EAT 😉 Girl, I love Christmas so much, I can’t even. And I totally agree with you – the best part is the plethora of cookies coming our way. I’m definitely going to try these cookies – they look PERFECT. I love your description of them: not too sweet and super chocolatey. I’ll bake them with a mug of hot chocolate nearby and Christmas songs blasting on the stereo. Oops, I forgot to tell you how pretty these photos are! Can’t wait to try these! I’m always looking for a new chocolate roll-out recipe! I’ve been meaning to email you to see how your holidays went! Sounds like you had a fabulous time and wow, on your feet for 3 days?! Awesome. I cheated and bought store bought pies because I was making everything else. Never again. Pies weren’t great. Blah. OK, oh my gawd, these cookies are perfection. 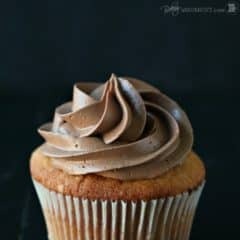 Pinned and totally going to bake these. . like I was telling Nancy, my “must bake ASAP” list is ever growing. . I’m going to gain like 10 lbs. . but I’m with you. . I love baking over the holidays. . with Christmas music on in the kitchen! 🙂 happy holidays! I love this recipe. I’m not a big fan of sugar cookies, but when they are chocolate then I can be interested. I love that these are extra chocolaty (I might try special dark cocoa powder). I bet they would make great sandwich cookies too. These beauties look amazing!!! I’m totally in a cookie-make-mood (just made my first batch on sunday 🙂 and I will definitely add this recipe to my to-do-cookie-list! 🙂 Have an amazing day dear Allie! These look delicious Allie! I am making these for sure to enjoy over the holidays! So glad you enjoyed, Samina! Thanks so much for the awesome feedback. Hope you’re having a fun week! These look indeed like perfect cookies ! And I LOOOVE these cookies! So pretty and chocolatey! Ha ha, right! You’ve got the right idea. Thanks for reading and commenting, Ana-Maria! Enjoy the season! These cookies are gorgeous ! I just recently decided I wanted to learn how to make pretty cookies and this recipe is fantastic! 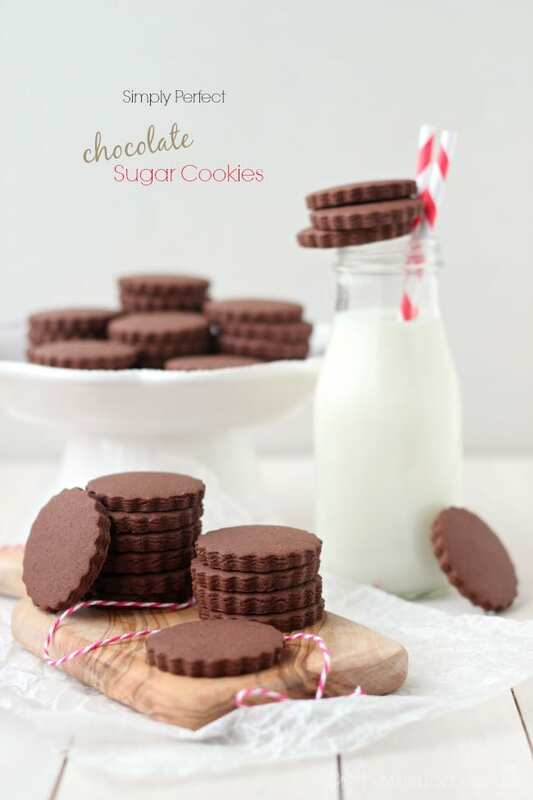 I love that you made them extra chocolately and I totally agree to cut back on the sugar when you are covering the cookie with more sugar…totally about balance 🙂 I can’t wait to try this recipe! Totally pinning it! Thanks for the pin, Liz! I hope you enjoy the recipe- it’s one of my absolute favorites. Enjoy the holiday season and have lots of fun making pretty cookies! Definitely saving, I need a good chocolate decorating cookie recipe, the last ones I made were a disaster! Sounds like your excited for Christmas, me too! Sounds like you had so much over there with your family. I was the same way …3 days in the kitchen. But, it’s always worth it. Always have to have everything …everything from scratch! I’m loving these cookies and pinning them …and printing out the recipe so I can make them very soon! I’ll let you know how they turn out! Oh yum! I can snack on these all day. Your photos are beautiful! Pinned. Yay! I’m so happy too… I hope you enjoy these cookies as much as I do. They are as fun to make as they are to eat! Thanks for the sweet comment, Karin! I’m so glad you had such a wonderful Thanksgiving Allie! I, too, am happy that Christmas season is here and these cookies are making me even happier. Such gorgeous, perfect cookies! I can’t wait to share this recipe with my sister because I know these will make it to our cookie decorating party this year. Pinned! The perfect little cookies…I have got to try these! Found you on Simply Gloria linky party! I know this is a treachery, but we just ran out of cocoa powder! 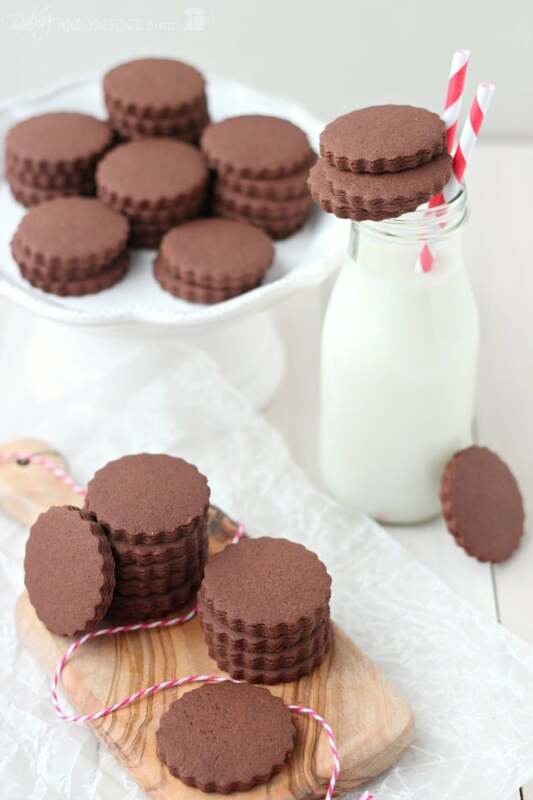 These cookies look so amazing, is there a way to make a plain, non-chocolate version? Hi Emma-Kate, if you read through the post again you’ll notice that I’ve linked to the vanilla version in the paragraph just before the last photo. Thanks for reading and good luck! They do look simply perfect!!! Yay!!! I’m so happy to hear that it worked so well for you! I hope you enjoy decorating and eating them. Thanks so much for reading my blog, Lis, and trying one of my recipes! What do you suggest if you do not have a paddle attachment? I cannot wait to try these out on my biscuit machine. I suppose it must be a little bit more moist to be able to spread out a little on the baking tray? Hey Herman! I don’t know… I’m not familiar with the biscuit machine thing. I typically roll these out with a rolling pin and cut them with cookie cutters. Cookies that spread are kinda my pet peeve, I prefer neat and clean edges, so this recipe is really great for that. Good luck and thanks for reading! I was excited to find a recipe that did not require refrigeration. It was tough to incorporate the cold butter, and the dough was very crumbly (I had to squish it together by hand), but they definitely did not spread when baking which was amazing! I’ve never baked cookies that did not spread. They don’t have much flavour to them, unfortunately. I think if I were to make them again I would add more sugar, but I think they will be ok with icing. That’s my next step! I’m so happy you were pleased with them, Laura! If they were that crumbly though, maybe next time you could do with a little less flour so they are easier to work with. I often find the quantity of flour can vary based on the weather that day. Also, if you use a really good quality cocoa powder, such as Valrhona, Scharffen-Berger, or Ghirardelli, it makes them super chocolatey! 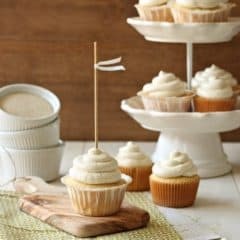 The flavor is on the less-sweet side, and that is intentional to balance the sweetness of the icing. Thanks so much for reading and for the comment! These cookies are simple and perfect. And are delicious too. I’m so happy you agree! Thank you, Aleesha! Thanks for the recipe! I was looking for a cutout cookie to make with my four year old, but no one except him in our house likes plain sugar cookies so I was very excited to find a chocolate one. Like the previous commenter, the dough turned out way too dry and wouldn’t roll or hold together without crumbling and falling apart (I only added 1.5 cups flour). I ended up adding another 1/4 cup of melted butter to get it to stay together, chilled it again, and then it was fine. 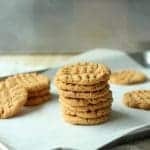 I also agree that they could use more sugar if you like a traditionally sweet cookie – these are just barely sweet but I find regular cookies way too sweet, so for me these are perfect – chocolaty and buttery, not cloying. They stayed perfectly crisp-edged with no spreading! I’m glad you enjoyed the flavor, Kate! I too prefer a less sweet cookie. I’m sorry for your crumbly dough, though! You were very smart to add more fat to balance it. Sometimes it can be tricky to get the right amount of flour- so many factors can play a part. I made these cookies and they were the worst things I have ever tasted. I followed the directions exactly and they were so dry and they actually tasted like chocolate flavored cardboard. They weren’t even sweet. I tried icing it in hopes it would taste better and that didn’t do anything. I was so disappointed. They are definitely not simply perfect chocolate sugar cookies. I’m so sorry to have disappointed you, Mama. Truly. This recipe is a favorite for my family, my kids love them especially with my homemade oreo filling, or decorated with sugary royal icing, or even just plain with a glass of milk. I guess everyone has their own idea of a perfect cookie, and I’m sorry that these just weren’t it for you. I just found you yesterday..and made your cookies today.. This is the first time i baked sugar cookies and its perfect…i like your recipe because its not so sweet, just perfect for my taste and the texture. Love it!!! I’m so pleased you think so, Anna! I too prefer them less sweet, especially since I often decorate them with royal icing, and that is so sugary. I’m sure you saw I got some negative comments on this one because of the decreased sugar. I’m glad to know that they worked so well for you though! Thanks for the positive feedback, and I hope you have a great weekend! These cookies look amazing. Any ideas on how to make them eggless? Hello, I just had to tell I had great success with your recipe. I used ‘Fred’ brand mustache cookie cutters for a fun party event and it worked brilliantly. Thank you for writing such an in depth post too. So glad to hear it, Loz! Thank you so much for taking the time to let me know. I love that recipe so much, it’s so great with royal icing! I’m so glad you agree and the mustache shapes must have been totally adorable! Wow, love these cookies! I used them to make a cookie basket and it looks wonderful! Oh, loved how they were super easy to make and you gave info on to refrig or not. I will be making them again and put them on my go to recipe when I am short on time.Thanks! just made these for my sons first for this weekend. delicious and bakes perfectly!! Hi there – I seem to be having a hard time finding a good chocolate sugar cookie recipe. The last one I tried was so crumbly I gave up and ended up throwing out two lbs of butter…..what a waste!! anyway this one sounded interesting to I decided to try it. I found that I have to agree with a previous poster that the taste was not great. I actually increased the sugar by 1/2 cup so we will see what that does…..also the cookies are not very stable… I was making grad caps and when moving the almost cool cookies to a cookie cooling rack the tassles would fall off. I lost several cookies and had to bake extra. I haven’t iced them yet but we will see – I hope I don’t lose all my tassles! Ok, well thanks for your feedback! If you like your cookies on the sweeter side then by all means you should increase the sugar. I developed the recipe with royal icing decorations in mind so I cut back for the sake of balance. Sorry you lost some of your tassles. If I didn’t say it in the post I should now- let them cool completely on the cookie sheet. They firm up quite a lot once they have completely cooled. Good luck with your project, thanks for reading, and for your feedback, Amber! Just baked these tonight and thought they were great! I appreciated all of the great tips and tricks for keeping the cookies from spreading and puffing, especially since my primary goal in baking these was to use my awesome new Firefly cookie cutters. Thanks for a great recipe! Yay I’m so glad they worked out for you! Thanks so much for reading and for the great feedback. Enjoy! Oh, yay! I’m so happy you liked it, Sophie. Happy birthday to your little girl, and thank you so much for the sweet comment! I was looking for a great chocolate sugar cookie, and these are perfect! They taste like an Oreo and they have a nice crispy/flaky texture. Love them – thanks! Hey Marion! I’ve done this many times with this recipe and it works great. Add the extract in at the very end 😉 Good luck and enjoy! These were fab! I added 1/2 t. of peppermint extract and made them into cut-outs… they were a hit! thanks! Yay! So glad you like them Angela! I was looking for a chocolate sugar cookie recipe to attempt these adorable almond-hugging bear cookies I spotted online. These sounded just right and looked simple! Definitely simple but I did have a moment of panic when the dough just didn’t seem to want to come together, even with the minimum amount of flour. A bit more butter and kneading smoothed it out though. I love that they didn’t spread, they stay so neat and tidy. I don’t think the recipe was appropriate for the adjusting I had to do to my cut outs but I’m definitely going to make another batch to simply ice. Much easier haha. And I love the taste, deep and chocolatey is a great description! Everyone’s getting cookies for Christmas! I’m so happy you liked them Laura! Sorry for your trouble with the dough being dry. I made a big batch of these yesterday and mine actually needed more flour so it’s interesting how much variation there can be. Thanks for the great feedback and I hope your loved ones enjoy the cookies this Christmas! These cookies look amazing ! How many could you make with this recipe ? Hi Nesme! It all depends upon the size of cutter you’re using and how thick you roll them. I just made a batch last week using a 2-inch square cutter and I ended up with close to 6 dozen cookies. They were rolled to a thickness of 1/4-inch. Hope that helps! Thanks so much for this recipe. My four-year-old son has been asking for a chocolate cookie recipe for us to cut out with his dinosaur shapes. We made them today and they are SO morish! I could see him gobbling up the dough out of the corner of my eye as we cut out the shapes! Perfect. I think I may have done something wrong, the texture of the dough was superb, it was so easy to work with, I was so excited that they looked beautiful. I made the cups out of this dough and appreciated the pictures you included to show that the cracking was normal. BUT! They do not taste good at all. They taste like flour and cocoa, dry and just not good. What did I do wrong? So many others raved about these cookies. I even made a second batch thinking I did something wrong, again perfect texture, horrible taste. They all went in the trash. Please help. Oh no- I’m so sorry to hear that the cookies weren’t to your liking! When I make them, I really like to bake them just until the edges are set, so they’re still a bit soft in the centers. Not gooey soft, but more like tender soft. This way they aren’t dry. It’s hard for me to say exactly how long they ought to be baked, because it of course depends upon the size of the cutter you are using. But usually under 10 minutes for a 2-inch diameter, 1/4″ thick cookie. And they are meant to be a bit less sweet, to balance out the flavor of all the sugary royal icing I typically decorate them with. I like them well enough by themselves, but when paired with a sweeter filling or icing they are really much tastier. I hope that helps! Thanks so much Kristy! Hi Allie! So, just to be sure….if we like a crispier cookie, I use 1/4 c more unsalted butter in place of 1 tbsp oil? Hey I’m so sorry for the late reply! But yes, that is right- if you like a crispier cookie you’ll just leave out the oil and do 3/4 cup butter instead. I hope that helps! Thanks so much for reading and I hope you enjoy Carey! Wow! I made these to go along with a batch of rolled sugar cookies- I used the same exact kind of cookie cutter that was used in the pictures. They came out so good. The chocolate flavor was spot on. These cookies definitely travel well because of their perfect texture. I am going to try making half a batch with peppermint oil to get a chocolate/mint flavor, just for fun, but these cookies are perfect as is! Hi Allie. I just finish making your perfect chocolate cookies for my daughter’s baptism. They turned out perfect, they are soft inside but crunchy outside and so tasty. To be honest I was skeptic about this recipe when I red that you put cornstarch in it. Now when they turned out perfect I have one question. Why do you put corn starch in recipe? Can I add corn starch in a simple vanilla sugar cookies too? I am asking this because I made half chocolate and half vanilla cookies but vanilla cookies turned out more dry inside then chocolate ones. Thank you for sharing this amazing recipe with us. I love love love this cookies !!! I wanted you to know I loved this recipe. Tickled my taste buds, delivered on texture. I added a bit extra cocoa cause i’m a fiend. Awesome! I’m so happy you liked the recipe, Barbara! And also that you found the notes helpful. I am the same way- I like to understand the science of it all 😉 Thanks so much for the great feedback! I was wondering if you have any idea if these freeze well? I’m pretty ambitious when I make Christmas cookie trays so my baking takes a couple of days. I try to make what I can ahead of time and freeze them until I need them (no more that 7 days ahead). Do you have any experience freezing these? Your blog and York cookies look amazing ? I was a little sceptical about this recipe when I was reading everyone’s comments but I just tried it (with a little more sugar than what the recipe asked for) and they turned out amazing! My first time making sugar cookies! I made this recipe as well and found it to be a little off with the “wet” ingredients. I added 3 T of evaporated milk, 1 T of powdered (confectioners) sugar, and 1 1/4 C flour, and they turned out great. They were more crunchy than soft which was fine with me. I cut them out in fluted, heart shapes for Valentines day and decorated them with royal icing – with piping and florets in pinks, reds, white, and lavender with touches of mint green. The icing added a beautiful appearance as well as an additional, small, but needed, sweet kick to these fudgy, delicious cookies! I’m so glad you were able to make it work, Linda! Your decorations sound beautiful, and perfect for the season. I baked these cookies today and they came out delicious! everyone around the house loved them. The kids loved them, however my little one did not like the salt. What if I make this w/o the salt? Also, I bake in a mini oven-toaster, so will baking time be shorter or longer? 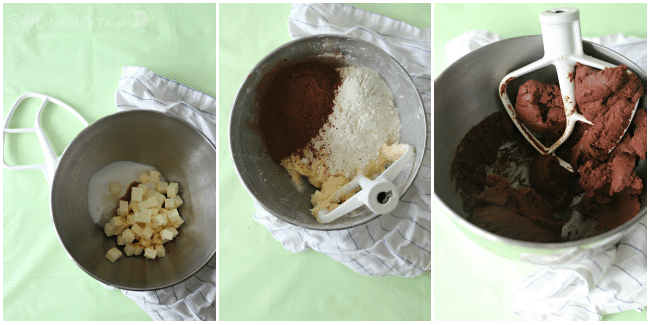 All in all – indeed perfect chocolate cookies! Thank you! I’m so happy you and everyone around the house loved them Carly! Thanks so much for the great feedback. You can absolutely leave out the salt or decrease the amount to your own taste. I’m not really sure about your toaster oven- they can all vary so much from model to model. I’d just keep an eye on them as they bake and pull them when they’re set in the middle. Good luck and enjoy! I have just finished baking these. They look exquisite, the rolling out easy. Will continue to make these chocolate cookies. Many thanks for a great recipe. That’s so wonderful Rosalind! I’m so happy you had an easy time rolling and I hope you enjoy the taste too! 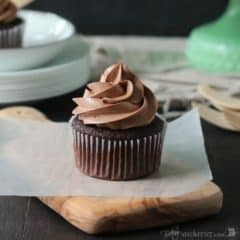 Check out this post for a great icing recipe for them! Very happy to have found this recipe. I needed a chocolate cut out cookie that was sturdy enough to mail in bulk (I made wedding favor cookies for a friend) as well as delicious. I found the dough a little soft in the handling (even after chilling), but they baked beautifully without spreading and were firm enough to pack and ship. I didn’t ice them (just sprinkled sparkling sugar on them before baking), and found them perfect as is. FYI, I made a triple batch to get about 5 dozen 3′ cookies. Thank you so much for the great feedback Janice! Next time if it seems too soft, feel free to add a little more flour to get it to exactly the right consistency. Sometimes the humidity in the air can have an effect on stuff like that. So happy you like this recipe; thanks again for sharing your experience here! These turned out great for me! I made them just as directed, and they are really delicious!! The only thing is they are a little crumbly – my kids made a huge mess eating them! Is there any way to cut down on the crumbs just a bit? Addie I’m so sorry- I know I replied to your comment a few days ago but it’s still showing up as unread so there must have been a glitch! Please just go ahead and add the flour it needs. Sometimes the dough can take more and sometimes less. 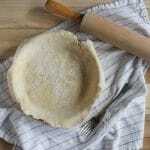 The key is to stop adding flour when the dough forms a ball and pulls away cleanly from the sides of the bowl. I hope that helps and again, I’m sorry my first reply didn’t go through! Made these today. Loved the dough. Easy to cut out very small little gingerbread men I use for cupcake decorations. Can I freeze the cookies. I do not want to ice them till Friday. I’m so happy you like them Diane! You can absolutely freeze them, they’ll hold up great till Friday. Have fun decorating! That sounds absolutely delicious Nikki! Butter: American butter with higher water and lower butterfat, or kerrygold higher butterfat, lower water? I’m going to omit the oil and increase the butter for a crunchier cookie. I love that you eliminated the leavening. When a sharp clean line and perfect shape is desired, leavening and butter can ruin the best laid plains. Thank you for all insight. 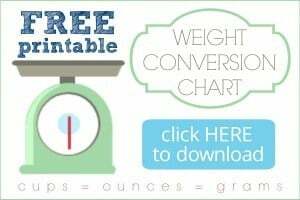 Flour: I have a printable weight conversion chart that you may find useful- https://bakingamoment.com/weight-conversions-for-baking/. Short answer: 120. Butter: I have used all kinds of butter, from the most expensive European import all the way down to the cheapest, generic grocery store brand. The higher butterfat always tastes better, but I haven’t found the difference (beyond flavor) to be all that much (in terms of the chemistry of the recipe). In other words, you could use whatever you prefer and the cookie should still bake up nicely. Thanks again for reading, and for the great questions! I hope I’ve been helpful. Enjoy your thin mints and have a great holiday season! Allie, thank you for the detailed response. I’m going to bake tomorrow, so it was timely. Based on your reply, I’m going to use Central Milling Pastry flour, soft white wheat (10%), and cut it with their AP Beehive flour (10.5%). I’ve blended the two successfully when I’ve wanted the strudy structure, but with a tender delicate crumb. White Lily is a lovely flour, but so difficult to find in California. On the rare occasions it shows up on the store shelves, it’s snapped up in a flash. I’m guilty of hoarding 20 lbs of it when I see it. I hoard it too Cate! The good news is, it’s available via mail-order, and from what I hear they’re expanding their availability. But it sounds like you’ve got it all figured out! Good luck with your thin mints and I hope you enjoy! Thanks so much Dora! I’m so glad you found me, lol! Great questions. I actually prefer them a little softer too, so I like your brown sugar idea and I think it’s totally fine to underbake. I would just make sure they feel “set” around the edges, and if they are going to be decorated with royal icing, that should really help the sturdiness factor (since it dries almost hard-candy-like). If you don’t already have a royal icing recipe you love, here’s my favorite: https://www.google.com/url?sa=t&rct=j&q=&esrc=s&source=web&cd=&cad=rja&uact=8&ved=0ahUKEwiZqKfbsuDRAhXojlQKHakaC_wQFggaMAA&url=http%3A%2F%2Fbakingamoment.com%2Ficed-chocolate-peppermint-cookies%2F&usg=AFQjCNFGX9rUwo2rdWQIg5KzfQkNph6qHg&sig2=xdFcl-NZohNmehzBPHGgbA&bvm=bv.145063293,d.eWE. Good luck and enjoy! Hey Amanda! Girl, I totally feel you. I go through SO much butter. For this recipe, I have not done all butter, but I have done a combination of butter and shortening, omitting the oil. The result is very good! If all shortening works out well for you, I’d love it if you could swing back and let me know. I’m sure there are probably other readers too who’d like to trim expenses. Thanks so much! I wondered if you had a regular sugar cookie recipe like this? Yes, I do! You can find that here Louis: https://bakingamoment.com/how-to-bake-easy-and-delicious-cutout-cookies-with-neat-edges/. Good luck and enjoy! Hi there, I just found your recipe while looking for a good recipe for chocolate cookies. They look amazing! My son is working on a school project where he needs to create his own cereal (box, advertisement, slogan, etc) using whatever ingredients he prefers. He decided on chocolate cookies and marshmallows (every kids dream, junk food for breakfast)(lol). While it is not required he actually make the cereal I thought it would be fun to really bring this project life. So, I think this recipe will be perfect to make an awesome tasting cereal. To make the cookies a small cereal size I’m going to use the one of the icing tips I use with my tubing bags. In making the cookies this small I’m unsure about the best baking time. Do you have a recommendation on this? Thanks, I appreciate you taking the time to help me out! Wow that sounds really fun! I would guesstimate no more than 5 minutes on a cookie that small, but that would depend a bit on how thick they are. It may be one of those things you’ll have to tinker around with. I like to pull mine from the oven when they’re set around the edges but still a bit soft in the center, but you might prefer them to be crunchy all the way through. Good luck and let me know how it all works out! Hi Allie! Let me tell you how fabulous this recipe is! I doubled it to roll out extra and freeze. I also added chocolate extract instead of the vanilla (cause why not?) They taste way better than the regular roll out sugar cookie recipes I’ve tried…and they hold their shape beautifully! I’ve cut and baked 2 sets of cookies now. I would post a pic but I don’t see anywhere to do so? Thank you so much for sharing! That’s so awesome to hear Chris! Thanks so much for the great feedback. PS- chocolate extract sounds like a great idea! I was thinking of making batman slice and cut cookie with this recipe. Thinking of this as the bat symbol and using your other vanilla recipe to be the outside. will they work as slice and back cookies and bake together? 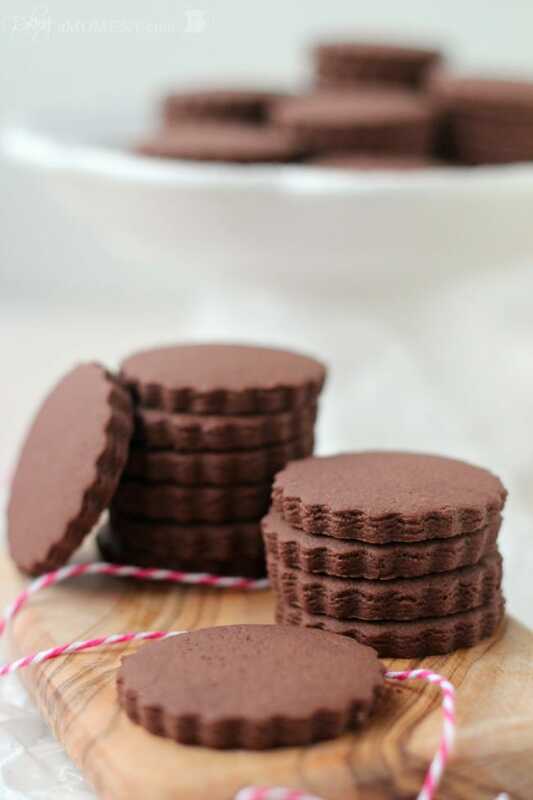 or am i best to go with the vanilla cut out cookie recipe and maybe add cocoa powder and black food colouring? Wow, what a fun idea! I think it could work well, especially if you’re using a dark cocoa powder. I would either stick to this recipe or just add black gel paste to some of the vanilla. If you added cocoa powder too the dough could become too stiff/tough. Good luck! Hi, just wondering how long in advance you can make these cookies? Will they keep for a week? Hi there! They should definitely keep for at least a week, but they tend to become more crunchy the longer they sit at room temp. If you’d like to keep them softer, I’d recommend freezing them in an airtight container until you’re ready to decorate/serve. Hope that’s helpful; thanks for reading Isabelle! This question is exactly what I was looking for too, trying to see how far in advance I can make the cookies. What do you recommend for the best method of defrosting the cookies? In the fridge or at room temp? I think either way would work just fine Rachel. These are a very sturdy cookie, it would be tough to mess them up! Good luck! This recipe looks great. I want to make little monkey shaped biscuits to top a cake I am making on Saturday. The challenge is that I dont have one of those cake mixer gadgets. I have a regular magimix, or I can do it by hand. Do you have any suggestions on how I can use either of those to make the recipe? Is a magimix like an electric hand mixer? If so I’d say use that to start, and as the dough starts to become very stiff, switch to kneading by hand. That should work well! Good luck- your idea sounds completely adorable! I just discovered your recipes and I love the ease of preparation and perfect results. I tried the chocolate sugar cookie today, they are excellent. Next time I make these I will add a touch of cayenne pepper and spice it up a bit. What a fun idea Elizabeth! I’m so happy you like the recipes- thank you for the sweet compliment! I ended up making both these and your perfect vanilla sugar cookies for a bake sale this week (and to test out my new Star Wars cookie cutters!) and everybody loved them. The chocolate ones went the fastest. I did notice, after making both recipes, that the chocolate ones stuck to the cookie cutters much worse than the vanilla ones, and I ended up refrigerating the rolled out dough for a few minutes to keep it from sticking. I love both of these recipes and I’m going to be making them many more times in the future! Thanks so much for the feedback Lauren! I’m glad chilling helped with the stickiness- another good option would have been to knead in just a little bit more flour. Thanks again for sharing your experience and I’m glad you were happy with the recipes overall! It was fantastic! The second time around I did add a lot more of the flour, but still had some sticky. Everyone I baked them for loved them, though! Hello, I want to try this recipe out but I don’t have a stand mixer. I’m afraid to try to with a hand mixer because I tried the vanilla simply sugar cookie of yours and followed the recipes and instructions (but with a hand instead of stand mixer) and the dough never really came together. I ended up having to add milk and water to get it to stick enough to roll out and found the cookie itself to be pretty unimpressive for all that work. 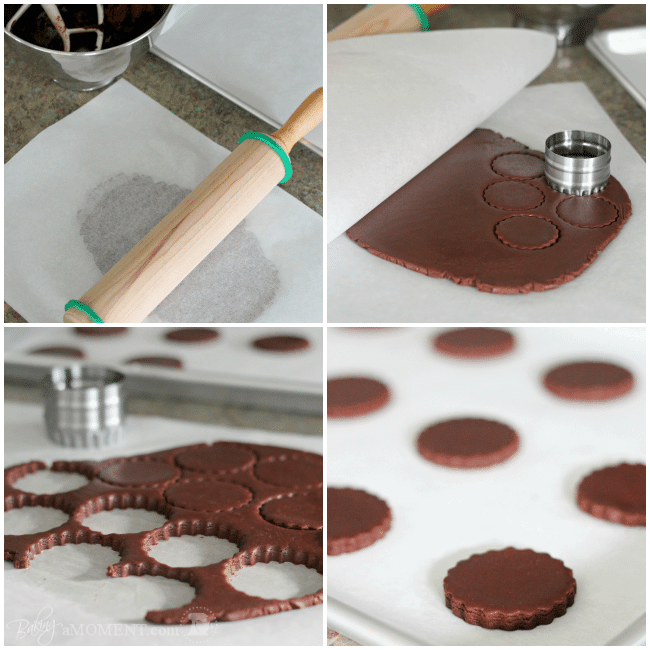 So would I be able to turn out these beautiful cocoa sugar cookies without a stand/paddle mixer? Hey Brooke. Sorry you found the cookies to be unimpressive. If you didn’t enjoy them, then you probably won’t like these either. These look delicious and I am eager to try them! However, I have some concerns about the cornstarch. Would substituting ground flaxmeal have the same effect? Hey Amanda! I’m so happy you like this recipe! I have not really tried adding ground flaxmeal, so I can’t say for sure if that would be a good substitute for cornstarch. If you don’t want to use cornstarch, you can leave it out and just add a little more flour. The dough won’t be quite as easy to work with, but it will still work. Hope that’s helpful! I made these cookies the other day and love them. If I want to make them now for Christmas would you suggest that I decorate and then freeze or freeze without frosting and decorate closer to Christmas? I plan on making these and your No Spread Sugar Cookies. So happy I found you and your recipes. Happy Holidays! Hi Kathy! I’m so happy you found me too! I would probably recommend freezing them without the frosting, just because I’d worry that the colors might run as they’re thawing out. Do you know what I mean? Like, if there is frost on top as it melts it might mess up your beautiful designs. I hope that’s helpful! Happy Holidays to you as well! You are too kind….my cookies are far from beautiful. I’m still practicing the decorating…and having issues with Royal Icing. I still haven’t been able to get it perfected…but I keep trying. Thank you again! I’m sure that’s not true- they’re beautiful because you’ve put your heart into it! Royal icing takes practice but once you get the hang of it, it’s so rewarding. It all has to do with how thick or thin your icing is. There are lots of great tutorials online. Check out Sweetopia, Sweet Sugarbelle, and Lila Loa, and Glorious Treats. They taught me everything I know! Keep up with it and enjoy the process! So I had this idea of using a really dark chocolate cookie dough for the cookies, and then icing them with only red and white icing. 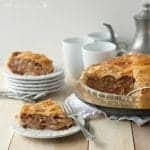 I googled for a recipe, and was delighted to find a recipe on Baking a Moment! I made the cookies – and they came out perfect! So thanks for this recipe and for an amazing website! I’m so happy it all worked out for you Sarah! Your cookies sound totally adorable. Thanks so much for the great feedback! This is the GREATEST COOKIE RECIPE!! I’ve been using it for decorates cookies for years and I will never even ATTEMPT another recipe!!! For vanilla cookies I use 2 cups of flour to substitute the cocoa for chocolate. They are perfect Everytime. So glad you’ve been happy with them Stephanie! Thank you so much for the great feedback! Hi Allie, I enjoyed your cookies a ton. My kids ate the hole entire batch. I made them for my son’s birthday and they were so succesful that all the moms wanted the recipe lol. They were quite moist but not very sweet which was a superb fit with the icing. I’m so happy to hear that Isabelle! I also like the balance of not-too-sweet cookie with the sugary royal icing. Thank you so much for the positive feedback! Allie, Does the cornstarch absorb the moisture in the cookie dough and possibly making a dry cookie? Well, I certainly wouldn’t be including in all my cookie recipes if I thought that was the case! Lol… the cornstarch is not an addition, but rather, it subs in for some of the flour. It provides structure just as flour would, but without gluten so the cookies are more soft and tender. Hi I love this recipe for choc biscuits I would like to use it as a cookie cake in a heart or a square don’t have a lot of time to experiment will it cook the same and hold shape in a larger size and shape. It’s for a birthday cake with rasberry cream and passionfruit curd. Hi Kylie! Larger cookies generally take longer to bake. The shape should still hold but depending on the size you will probably need to bake it longer. Good luck! Is there any way to help if it is tough and crumbly? Hey Katie! If you accidentally add too much flour, or if the dough sits a little too long and gets dry, you can moisten it back up with a few teaspoons of heavy cream. Good luck! My apologies! There is a glitch on that particular post that I am working to get to the bottom of. I have a request in to my support team and am waiting for them to get back to me. On the back end of the site, the recipe code is all there but for some reason it is not displaying. Hopefully it will be sorted out by the end of the day. Sorry! Oh wow! That’s great! Sorry for the glitch with the recipe but I’m happy you were finally able to access it. Thanks for the 5-star rating! Enjoy! I just discovered your site. Read all about your Simply Perfect Chocolate Cookies. 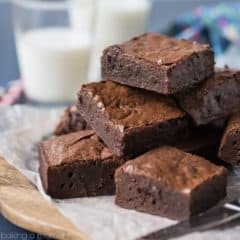 They look delicious and I would love to make them but I cannot find the recipe on your site. Can you tell me how I can get it. Thank you. My apologies Dale! There is a glitch on that particular post that I am working to get to the bottom of. I have a request in to my support team and am waiting for them to get back to me. On the back end of the site, the recipe code is all there but for some reason it is not displaying. Hopefully it will be sorted out by the end of the day. Sorry! My apologies Mary! There is a glitch on this particular post that I am working to get to the bottom of. I have a request in to my support team and am waiting for them to get back to me. On the back end of the site, the recipe code is all there but for some reason it is not displaying. Hopefully it will be sorted out by the end of the day. So sorry! I like the look of this recipe but I’m worried about the cookie’s being to soft. I’d like to use the recipe to make a chocolate gingerbread house for the holidays, so the cookies would be large squares instead of small circles and they would need to be able to stand up and support weight of icing and candies. Would this recipe work or is there some tweaking I could do to make it work? Such as adding more flour to get a sturdier dough. Thanks so much! Hey Marli! So funny you should ask that- I actually used this dough to make gingerbread houses last year. I made 2- they stood about 10 inches high. I gave one to each of my boys to decorate. They had so much fun and the houses stood up great. We had them displayed for probably about 3 weeks. Good luck and I hope you enjoy! I made these today using Hershey Special Dark Cocoa. These were amazing! It took my cookie stamp very well. Since I was not going to frost them, I added an extra scant 1/4 cup of sugar. These will be added to our yearly goodie tray to the neighbors. Very good, very chocolaty!! Thank you! That’s fantastic Debbie! I’m so glad it worked well with the cookie stamp. And that was smart to add a little more sugar since they weren’t being iced. Thanks so much for the great review! Yay! I love those ideas! Sounds fantastic. Have fun baking and enjoy the party Tarisa! Yes, that would be great. Always nice to get ahead on stuff like that. You definitely can, but I would recommend using just a bit less flour if you go that route. I’ve noticed that the dough becomes drier as it sits. If you do find it to be too dry or crumbly after it thaws, you can just pop it back into the mixer and moisten it back up with a few teaspoons of heavy cream. Hope that’s helpful Kailyn! Have a great holiday! Wonderful, thank you! Separate questing, do you think dutched cocoa would be fine? Yes, you can use Dutched cocoa if you prefer. It will yield a different and unique flavor, similar to an Oreo. Hope you enjoy! I made these today, omg they taste AMAZING!! This is definately a keeper for me!!! So happy you liked them Suzy! Thank you so much for the great review! So happy I found this recipe. These cookies are amazing. I made one batch and forgot salt (still delicious). This is my go-to Christmas cookie for decorating this season! I’m so happy you love it Dawn! Thank you so much for the 5 stars! I love your recipe! They are delicious and do not spread. This is our second year making these for Christmas cookies. They do not spread so the shapes are perfect. And they taste and smell richly chocolate. So happy you like it Ellen! Thanks so much for the positive feedback! Followed the recipe to the T. The dough ended up being very crumbly—seems like there’s too much flour, corn starch and cocoa powder; not enough fat. Cookies were VERY rich and chocolatey. Not pleased with this recipe at all. They are very rich and chocolatey, that is true. If you are not a fan of rich and chocolatey, you probably wouldn’t enjoy this recipe. The dough is often crumbly at first but if you keep mixing it does come together. Also, do mind step number 4, where it says to only add flour a little at a time, until the dough forms. If you add it all at once you will not have the proper result. Great tip Lorraine! Thanks for sharing! Your cookies look delicious! I plan on trying them out this weekend. If I were to use salted butter, should I omit the kosher salt completely or reduce the salt amount by half (1/2 teaspoon)? It’s hard for me to say I’m afraid! Different brands of butter have different salt levels. This is one of the reasons why I always recommend using unsalted butter. I’m afraid the only way to really know is to give it a taste. Sorry I can’t be of more help! I see most of these comments are from several years ago, but I just had to tell you how much I love your recipe for the vanilla cut outs. I’ve made them many times and they are delicious, easy and perfect every time! Now I’m excited to make these chocolate cut outs for valentines! Love the tips and tricks! Yay! So happy you’ve been pleased Diane. Hope you enjoy this one just as much! Can you make this cookie dough ahead of time and freeze it, then defrost and cut out the cookies? Yes but if you plan on doing that, you want to slightly decrease the amount of flour used in the dough. If it’s not used right away, it tends to become more dry and crumbly as it sits. Can’t wait to bake them!!!! Is butter salted or unsalted? Hi Vee! These cookies are pretty typical of most other cutout cookie recipes in terms of storage and shelf life. Probably a week or two at room temp in an airtight container.